We hear its distinctive , rattling call almost every day during the summer, very seldom we see the bird, and I have never had a chance to aim my glass at a Yellow-billed Cuckoo. Until today! 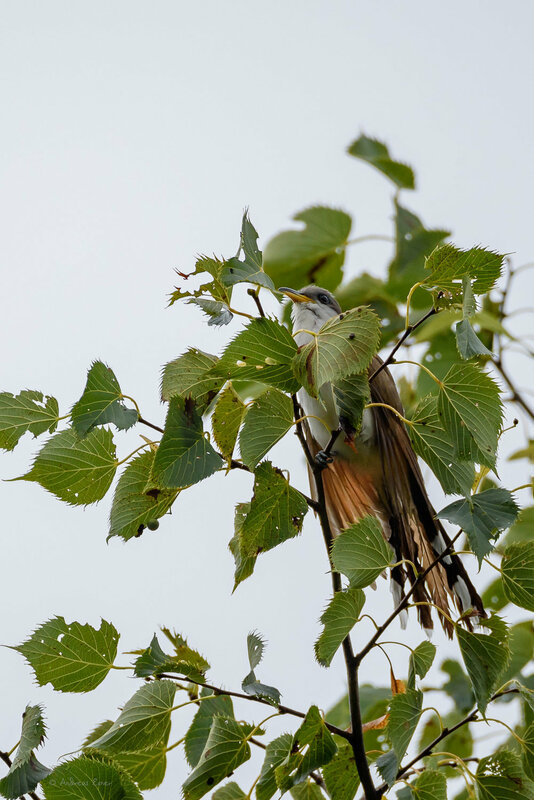 This cuckoo spends its time high up in the canopy of the trees and it is very difficult to spot it, even if you know where the bird might be, because of the unique call. This morning, after walking with our little dog Cooper, I heard the bird again and finally saw it sitting high up in a tree above our driveway. Well, against all common sense rules, I shot against a gray sky, but I wanted at least a documentary shot of this bird so badly that I gave a damn about rules. Of course, this is not a quality image. I cropped this picture to death, but still think it is an honest shot because I had no chance to get any closer. Last night we had thunderstorms with much needed rain passing through, for more than 12 hours. It looks like the cuckoo tried to use the first hint of sun to dry its feathers.